Hello there, today I have the absolute pleasure of being the Featured Artist over at Tag You're It. If you haven't heard of the challenge, it is where a designer makes a clean and simple tag or card to share with the rest of the design team and anyone playing along. The participants then make another tag or card based on that tag. I was kindly asked if I would like to be the guest artist and make tag for everyone else to be inspired by. I started off by cutting the Clearly Besotted Rounded Tag from white cardstock. I then took the Gerberra image from the Miniature Florals Collection stamp set and stamped this on the tag using black ink. The flower was then coloured using Copic Markers. For the background, I coloured the whole area with shades of blue and then went in with the Copic Colourless Blender to add some dots for texture. I then took the sentiment, from the Clearly Besotted A Little Sentimental set, and stamped this on to a piece of white cardstock with more black ink. This was then cut out and added to the tag with foam tape. To finish off, I added some black twine through the top of the tag. COPIC MARKERS: Flower petals - YR68, YR65, YR61. Inside - YR68, YR27, E08, E09. Stem & leaves - YG17, YG23, YG03. Background - B06, B04, B02, B00, B000, B0000, 0. Please pop over to see the challenge. I would love it if you took part, it is such a fun challenge! A big thank you goes to Tracey for having me guest for the challenge. Thank you so much for visiting me today. I hope you have a great day and a great weekend too! Michele your tag is just gorgeous! I read over your instructions and I am in awe that you coloured the whole tag with Copics! You blended the background just beautifully! Thank you so much for being our Featured Artist this challenge at Tag You're It!! Beautiful tag Michele, congrats on being the featured artist. Well deserved. Beautiful tag and gorgeous coloring! Congrats on being featured at TYIC! Really gorgeous tag, Michelle! I love how you used your Copics for the bloom and your background...so pretty! This is such a pretty tag...love how that flower pops off the background. What a sweet tag! I love the colorful flower and the blue background is fabulous! 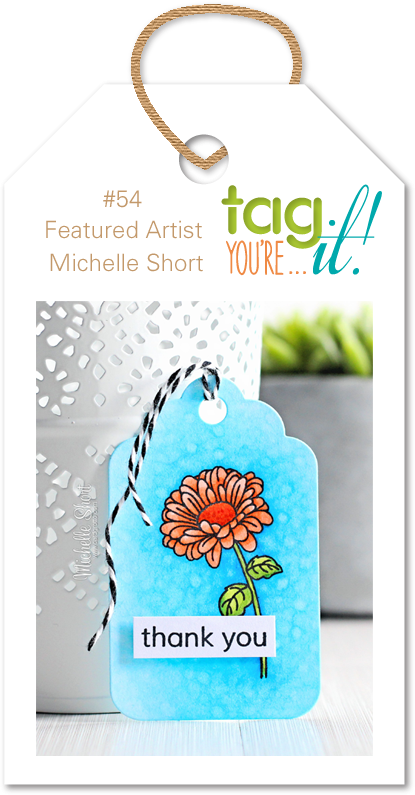 Michelle, it was so much fun using your pretty tag as the inspiration at Tag it... love the blue background... sweet little flower.